Click here for this year's Pep Band Schedule. The SHS Pep Band is known state-wide for its spirit, energy, music and, of course, pep. 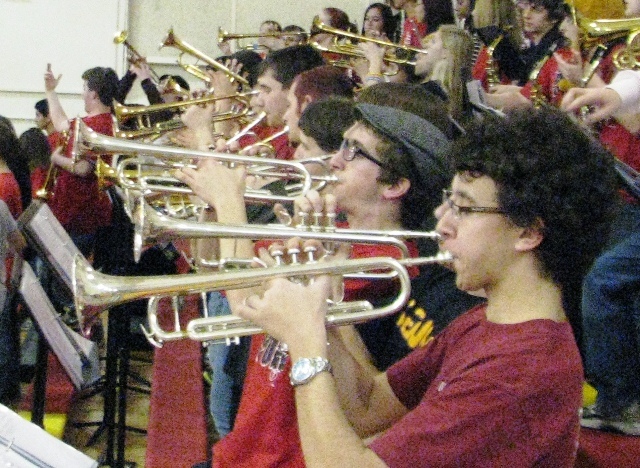 Coming out of hibernation during the basketball season, the Pep Band dances, cheers, and plays during Basketball games. The Saxon Band is a giant part of the Saxon Superfans as they aid in intimidating the opposing basketball teams. Thanks to the Pep Band, most other Basketball teams feel scared while playing in Schaumburg's gymnasium. While cheering, chanting, yelling, and dancing are just not enough, the Pep Band's musicality astounds the audience. Adding new songs each season along with favorites such as "Sweet Caroline" and "Dynamite," every pep event is fun for any audience. Games end with the favorites "Hey Baby" and "Gimme Some Lovin'" along with the Saxon Fight Song. The Pep Band has a reputation for getting people on their feet and moving. Words not enough for you? Visit a game and experience it for yourself. Come for the game; stay for the band.